Home » appalachia , celebration , maggie valley , moonshine , north carolina , popcorn sutton , popcorn sutton acoustic jam , waynesville » The 2nd Annual Popcorn Sutton Acoustic Jam is getting BIGGER! The 2nd Annual Popcorn Sutton Acoustic Jam is getting BIGGER! There have been some developments (to put it mildly) since I first posted two weeks ago about the 2nd Annual Popcorn Sutton Acoustic Jam happening August 6th. I've been in regular contact with the event organizers and folks, this lil' celebration of the life and legend of Marvin "Popcorn" Sutton is literally seeing good stuff happen with each passing day! First thing that everyone should know about is that the event has moved! 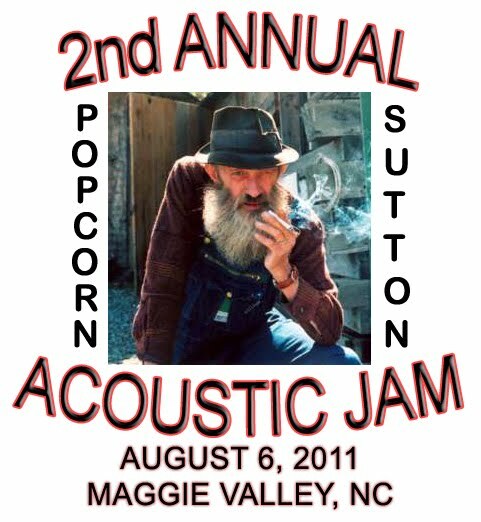 There's been so MUCH interest and plenty enough people saying that they're gonna be attending, that the 2nd Annual Popcorn Sutton Acoustic Jam is now being held at the Maggie Valley Festival Grounds in astonishingly beautiful Maggie Valley, North Carolina (which is right next door to Waynesville, where it was going to be originally held). Set your GPS units accordingly! There should be plenty of parking for everyone. You should also plan to be there for awhile, 'cuz the tribute is now scheduled to last from noon until 10 p.m.
And as of this writing, the list of musical acts scheduled to appear is growing. Michelle Leigh, Tennessee Jed, the Josh Fields Band, Ali Randolph & Outta Luck Band, and Maggie Valley's very own "Man in Black", Charlie Duke have all confirmed to be there! Probably be lots more performers announced during this next week as the event draws closer. ATTENTION!!!! For all who will be attending the Popcorn Sutton Acoustic Jam in Maggie Valley,NC on August 6th, there will be a Popcorn Sutton look-alike contest at the event. Come in your best Popcorn get-up! There will be a wonderful prize for the 1st place winner and the judge will be the one and only Mrs. Popcorn!!! There is a Facebook event listing and a Craigslist page for the 2nd Annual Popcorn Sutton Acoustic Jam. Keep checking both of them as next Saturday gets nearer. I'm planning to drive from Reidsville on the day before so I can commit all of next weekend to honoring the memory of Popcorn Sutton: a man who I never got to meet, but had already long respected and appreciated. And I'm extremely looking forward to meeting many more of his fans and admirers this coming Saturday! THAT LIL ALI RANDOLPH & OUTTA LUCK BAND WILL TAKE YOU ON A HARD MOUNTAIN ROCK ON DOWN INTO A VALLEY of BLUEGRASS, AND TOSS YOU BACK OUT INTO THE COUNTRY !